I had an amazing weekend at the Free to Be Me Bloggers’ Retreat. There’s so much to share, but I’m still processing. I do want to show you a glimpse of the glory He poured over me this weekend. These skies are truly a picture of how much He blessed me this past weekend. 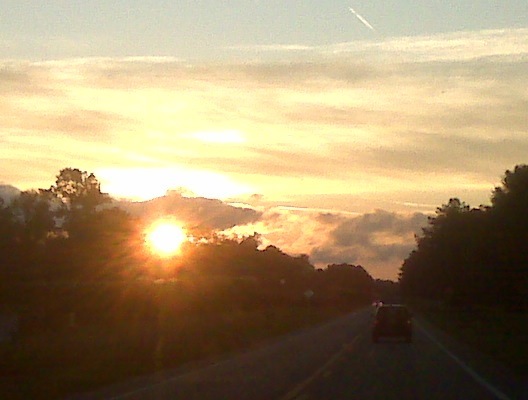 Watching the sunrise on my way to the retreat Saturday morning. One amazing sky . . . .
And the sun setting on my weekend. It was an incredible weekend of worship, fellowship and time in the Word of God! 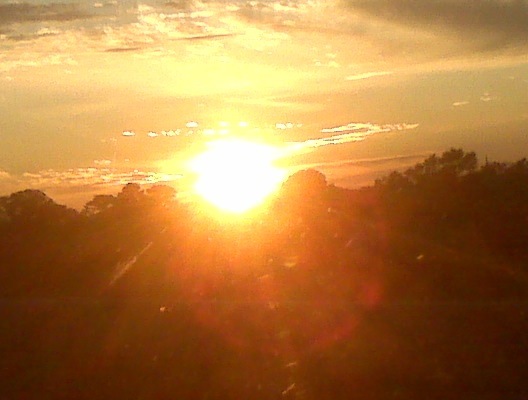 I love that the Lord put His glory in my windshield! To Him be all Glory & Praise! 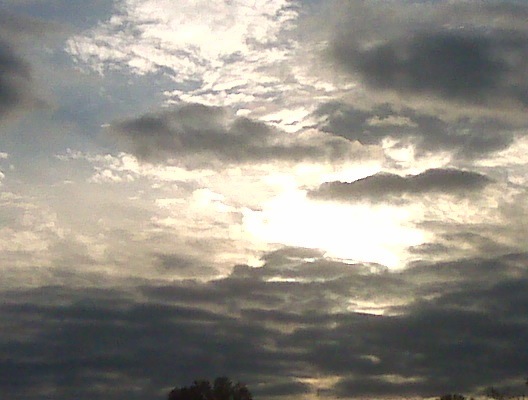 When He’s close reflected in His creation like that, it’s easier to forget our own pharasaical expectations, no? So you met a whole heap of bloggers in the skin? You got to hug ’em? I am like you. Still processing. When my work load is caught up at the office…He will pour out on us the words to say. I am just loving reading what the LORD has done in each heart and life. I know He did something in mine that I did not expect! Wow! How like God is that!!!! I would love to sit with you and chat this all out!!! One day. One day. He will give us that opportunity! Loved the skies. Loved meeting you. You blessed me so much. Can’t wait to see you again. Like you, I’m still processing. I’m so missing you GIRLFRIEND! My roommate buddy!!! It was truly a treat to meet you Mary. We have way to much in common not to keep in touch Sister. I am excited about what GOD will do next! He is GOD! We can expect ONLY His greatness. I love you. I’ll be in touch. I meant to tell you…when you get that hot little book of yours in your pretty little hands, let me know. I’d love to blog about it or have a book giveaway to garner a little attention in my neck of the woods. Enjoyed you LOTS. I think we may have been separated at birth. Have lots in common. But then again, could be our love for Jesus and dislike of communism/socialism. The sunrise that morning was breathtaking… You captured it perfectly. Girl, I can’t wait to see how the Lord works through this past weekend. Many victories are at hand. A ton has happened already. Isn’t that just like our Jesus. I am hoping Gos works it out so we can get together again soon. I’m talkin just a few months. Watch, He’s got it worked out. Those pictures are gorgeous! That sounds like an amazing retreat – glad you got to enjoy it! There’s still so much to process and it’s been over a week. God is so good. I’m so thankful I finally got to meet Mary R. Snyder! So thankful to know you put your jeans on the same way the rest of us do, one leg at a time, and that you fully rely on God all the time. Just a real woman that easy to relate to.